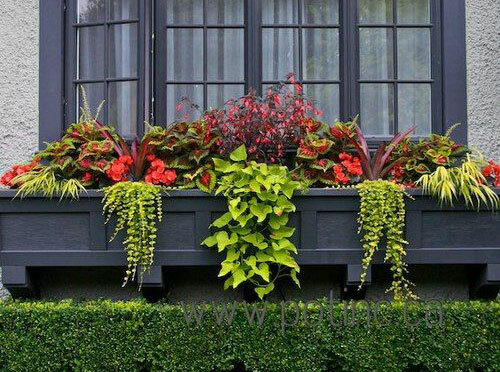 You really don't need to be an expert to create a lush, stunning, window box garden planter. By following a few easy steps listed below, you should be able to create a Arizona Pottery planter that is just as lovely for your home or garden area. 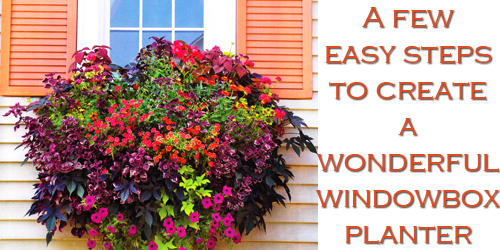 Of course, the first place to start is with a windowbox garden planter. We recommend a lightweight, rectangular shaped box, that has a way to connect to a wall securely. A poly resin planter is nice because it is lightweight, super durable, large enough to hold a display of colorful plant materials and easy to locate and purchase. If you can find one with removable drain plugs, even better, because then you can control when and if the water drains. Start with a good lightweight soil mix that contains water absorbent crystals. By adding them you can increase the amount of water the soil can hold. Add a slow release fertilizer and make sure it is mixed in well. Prepare the plant materials. This is a fun step and when you can get most creative. Select your favorite plants, change the look each season, or take a trip to the local nursery and see what is being promoted at that time of year. Try to mix up the plants. Use trailing vines and plants that stand upright. This will add depth and interest. 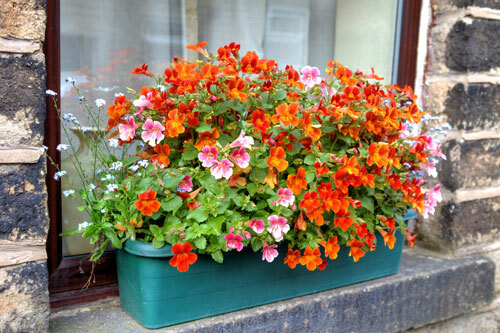 Make sure they are planted close to together, using up to 20 plants per windowbox, but also don't over crowd. Leave room for plant growth. Keep placing them and tucking them into each other until you get the look you are striving for. Remember that the planter can only hold so much weight so don't over pack. Pack around the plants with more potting soil and make sure there are no air pockets left. 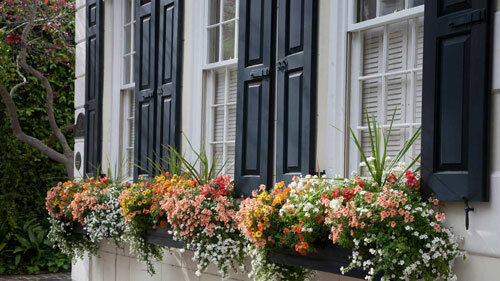 Keep the window box planters watered. Try to water each morning for the best results. The amount of water needed will depend on where the sun hits them, if it's a windy day and what type of plants are being used. These types of planters are fun to create, easy to maintain and will add an ornamental look to the side of any home or garden area. Read more.....Autumn containers using evergreens.